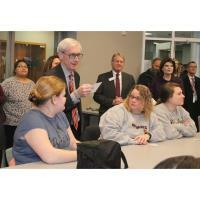 Eau Claire, WI – The day after delivering his first State-of-the-State Address, Wisconsin Governor Tony Evers visited Chippewa Valley Technical College in Eau Claire to follow up on his message and the role education plays in his agenda. Jonathan Fike then provided a tour of the state-of-the-art kitchen facilities considered one of the best teaching kitchens in the nation. With 95 programs and both online and on-campus classes, Chippewa Valley Technical College delivers superior, progressive technical education which improves the lives of students, meets the workforce needs of the region, and strengthens the community. CVTC programs are designed with input of business and industry to prepare graduates for today’s jobs, with 93 percent employed within six months of graduation and associate degree graduates earning an average annual salary of $44,000.